Sarah Palin recently made headlines in the media for getting some facts wrong when citing a Wall Street Journal article in her most recent Facebook rant. Many people observed Palin's most recent gaffe, but that didn't stop Palin or her staffers to try and control the flow of information. John Dickerson from Slate decided to participate in the conversation on Sarah Palin's Facebook page to see the interactions from Palin's online community, but unfortunately Dickerson's attempts failed - the Palin team deleted any comment painting the former half-term governor in a negative light, no matter how factual it was. But then I read Reddy's critique and the story Palin says undermines it. The story Palin cites to support her claim doesn't do that. 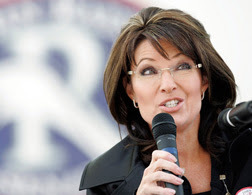 In her speech, Palin said that "prices have risen significantly over the past year or so." The Journal article says prices are only "beginning" to rise. The time period of "significant" increase Palin is talking about is referred to in the first sentence of the exculpatory article as "the tamest year of food pricing in nearly two decades." I made this point in a few sentences and posted them on Palin's Facebook page in the space allotted for readers to participate in the conversations she starts. I wanted to see if any of the other participants would respond, as they sometimes do. They didn't—because within two minutes, my post had been deleted from the steady stream of acclaim from Palin fans congratulating her for tweaking the media and urging her to run for president. It's the first time I've been kicked out of a place of worship. Whoever administers the page for Palin had deleted me so fast I didn't even have a copy of what I'd written. This is very interesting - Palin censors comments that may destroy her image, because after all, she wouldn't want her fans to know that she knows absolutely nothing about monetary policy. What is even more alarming is not that she censored her Facebook page's comments, but that she did not even bother to change her note, meaning she does not care that she is lying. And if she tries to post on Palin's page again, she'll find she's been banned. The censorship immediately followed by banning has been going on since Palin first created her Facebook page. Only cheerleaders are allowed, not critics. Welcome to the club. I can't wait for Palin to try and run for office again - the media scrutiny will be enough to drive her insane!